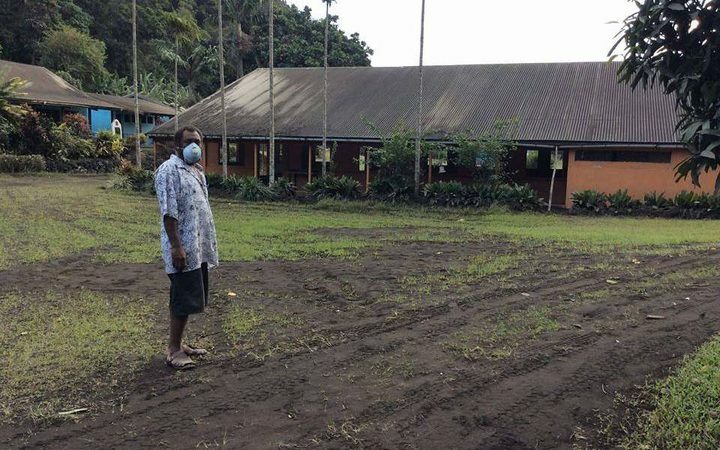 The Vanuatu Government declared a state of emergency for the island of Ambae in mid-April 2018 as volcanic ash was again spewing ash and smoke into the air. The volcanic activity has been causing acid rain and potentially making the island uninhabitable. The Vanuatu Government confirmed on 19 April that the evacuation of all 11,000 residents of Ambae would be permanent. Our partner, the Anglican Church of Melanesia (ACOM), is playing a leading role in the national response. One of its schools, St Patrick’s College, has been heavily impacted. Radio New Zealand has reported that the school made the decision to cancel exams. Its principal, Kathleen Tahi, says ash has swept into the valley where the school is situated, invading every building and making breathing very difficult. She says students had little to eat or drink. “Our water tanks are all contaminated. Food, the students we had no vegetables, nothing to eat, and the students just ate noodles,” she said. The Guardian Australia has also reported that ash as deep as 30cm had settled on many parts of the island, and people were experiencing breathing difficulties, skin reactions and illnesses such as chest infections as they waited to leave. Food supplies and animal feed are beginning to run out, water is contaminated by ash and disease has been spreading among the evacuees, most of whom are subsistence farmers. Police and some aid agencies are already in place, with the army expected to arrive later this week to orchestrate the mass evacuation which this times looks to be permanent. Please keep the people of Ambae, as well our partner, ACOM in your prayers as the evacuation and resettlement of people continues. To read the full article from Radio New Zealand, click here. To read the full article from The Guardian Australia, click here.